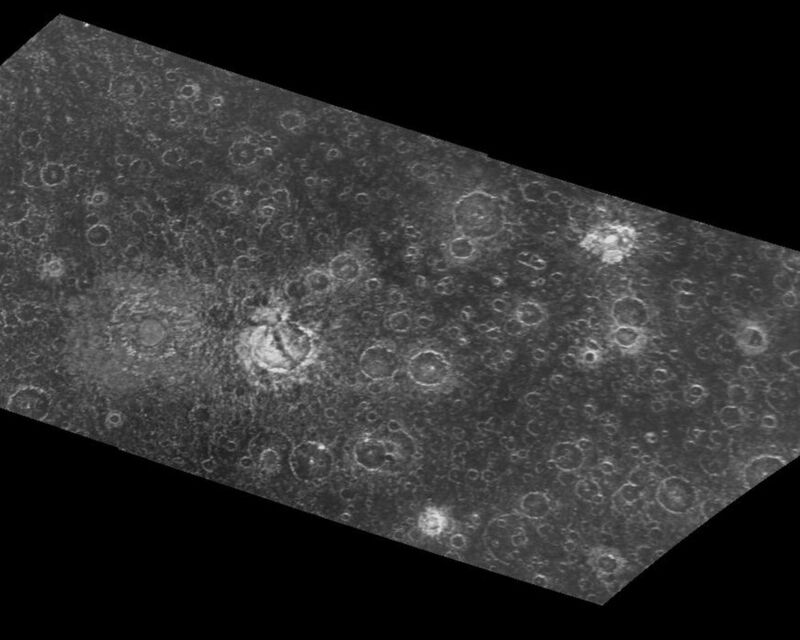 This two frame mosaic of images from NASA's Galileo spacecraft shows an area in the southern hemisphere of Jupiter's moon, Callisto, that was not imaged during the 1979 flyby of NASA's Voyager spacecraft. North is to the top of the image. 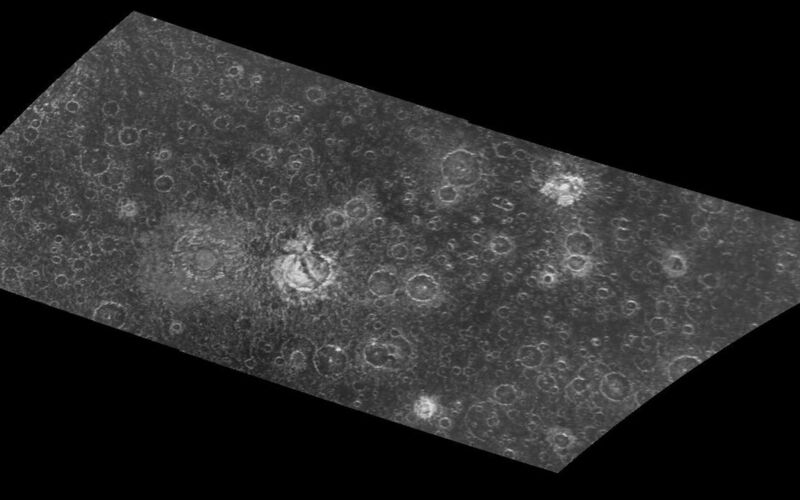 Craters can be seen in this mosaic from less than 3 kilometers (Picture elements in this image are 0.93 kilometers (0.63 miles) across.) up to the 83 kilometer (51 mile) central dome crater Barri, just left (west) of the center of the mosaic. The ejecta (material thrown from the crater during its formation) from Barri can be seen as a diffuse halo or ring stretching to approximately one crater radius from the outer crater rim. The smaller, younger craters are brighter and have sharper, more pronounced rims. Thorir, a 43 kilometer (26 mile) crater just left of center, is cut by a central valley or fracture. This cross-cutting relationship indicates that Thorir is older than the event that produced this fracture. 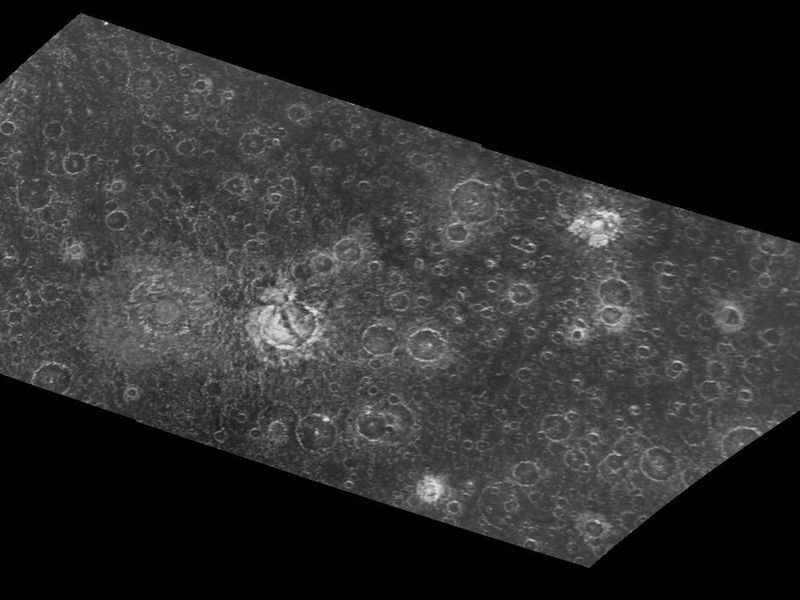 Scientists study the different crater morphologies (shapes) to determine crustal and surface conditions since the craters were formed on these icy moons. This image was taken by the Galileo spacecraft's solid state imaging (CCD) system during its eighth orbit around Jupiter, on May 6th, 1997. The center of the image is located at 30.2 degrees south latitude, 66.1 degrees west longitude, and it was taken when the spacecraft was approximately 48,549 kilometers (29,615 miles) from Callisto.